A warm welcome to pilots new and old. 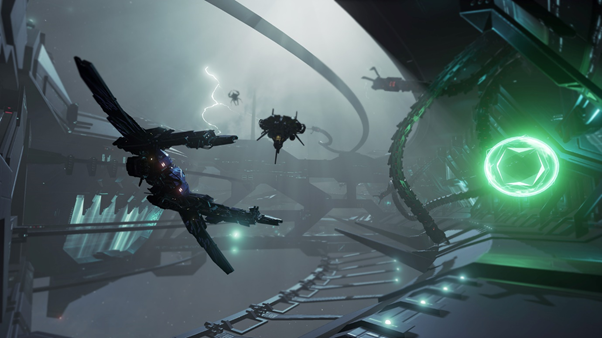 My name is CCP TerrorShark, Game Designer on EVE: Valkyrie, and I’m here to talk you through the new Extraction game mode we’re introducing in the upcoming Warzone expansion. For the last few months, CCP Badhorse and I have been responsible for bringing you unique and twisted Wormhole events every weekend, building game altering modifiers, modes and maps with help from our incredible creative community. Check out our Building Wormhole Thread. It was from the no-holds-barred, frantic chaos of Wormhole gameplay that the seed of Extraction was sewn. A high intensity, clutch play, edge of your seat battle that caused screams and cries across the Valkyrie office during our internal playtests. It was too much fun not to deliver to you, our legendary pilots! Our Quartermaster has a task for you; a mission of the utmost importance. 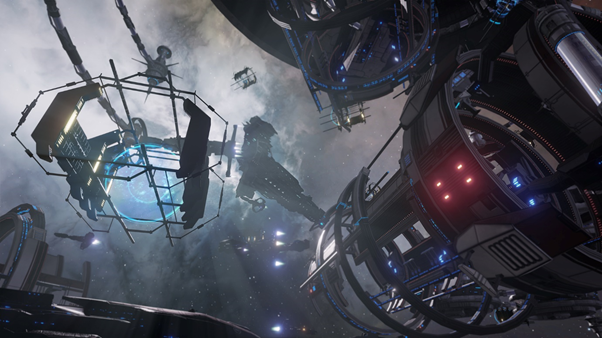 The Drifters, an ancient race of technologically superior beings, have discovered and cloaked ‘Relics’ across the galaxy; orbs containing secrets of our past and keys to the future of Valkyrie warfare. It’s your job to find these Relics and deliver them back to our mysterious friend in one piece, through strategically placed Smuggler Gates. Extraction Mode is about healing, pushing, boosting and blasting your way to the finish line, delivering the Relic to the Smuggler Gate drop zone by any means necessary. It’s a team sport that requires collaboration and coordination if you’re going to come out on top. At its core, it’s split into two phases: capture and delivery. Game Phase One: Capture – The Scramble. Every match begins with the Relic appearing dead center in the map. Sitting equidistant from both carriers, the big prize is up for grabs to the first pilot who dares push out from the crowd and take it. The Relic, however, is a powerful and mysterious object, and carrying it does come with some consequences. Its added weight and radiant core will cause your capacitor to burn at twice the standard rate. That’s going to make your ship 50% less efficient on that long run to the drop-off point, so use your boost wisely. Use it all to make the pick-up and you’ll have nothing left for the delivery. The best Extraction pilots will balance and manage resources perfectly. Now we have three possibilities here, either you picked up the Relic, one of your teammates picked up the Relic, or (worst case scenario) the enemy have picked up the Relic! We have different missions, goals and objectives depending on how the pickup went, so let’s take a look at a few scenarios. Congratulations pilot. You’re the fastest runner in the pack, you put it all on the line and came out on top. But now your entire team is relying on you to get the package to the drop-off point. No pressure! You’ve painted a HUGE target on your back and every enemy wants to tear off a little piece, until you’re nothing more than dust particles and a faint memory. Pick a good flight path, use the environment and work with your team to get across the finish line by whatever means necessary. Your Team got the Relic! You missed it this time round but one of your incredible teammates has picked up the slack. The drop-off site is half the map away and your teammate’s burning through capacitor fast! “Assist me!” comes the call across your comms, this pilot is in serious need of your help, and it’s your job to get them there. Shoot down enemy pursuers in the Assault, brute force them out the way in the Heavy or heal your teammate to victory in the Support. Having a range of classes at your disposal is key to your chosen runner making the delivery in one piece. The enemy captured the Relic! The opportunity slipped through your fingers and the enemy snapped up the Relic from right under your noses. It’s all hands on deck, pilot. You and your team must do everything in your power to destroy that enemy ship and stop it reaching the drop zone. Keep the target in sight at all costs. Disrupt, damage and destroy, just don’t let them get away from you! The Quartermaster rewards only those who deliver. It’s available to play across all of our classic maps as well as the two new environments you can hear more about with @ccpStarbug. See you in the skies, Relic hunters!